In a remote Yemeni desert town, occasionally occupied by al-Qaeda, a community leader named Ahmed stood over a shallow pit. Dust was being kicked up by the young men in and around it as they struggled with large black tubes. But, despite a brutal ongoing civil war and ever-present militant groups, these were not weapons, they were piping for water. The town had been slated to receive water infrastructure, but in the midst of ongoing violence, this aid never came. The absence of the Yemeni government gives al Qaeda and other militant groups a perfect opportunity to gain local support by providing basic social services to communities. Some of the youth that Ahmed had enlisted in building the new pipeline had previously been drawn to the militants, seeking a sense of purpose. Now they sweated and struggled with the coil of pipe, intent on succeeding at bringing water to their parched town. Two months prior, Ahmed had identified water as a principle cause of conflict in his town. ICRD was holding a training for faith and community leaders on conflict analysis and preventing violent extremism. “If we can provide water and at the same time involve the local youth,” he had said, “we could solve a number of issues at once.” And so the water project was born. These are ICRD’s local partners. These are the heroes of the work, who advance dialogue and reconciliation, often at great risk to themselves. Across Yemen the war rages and recruitment of youth to violent extremist groups is high. These groups offer young people a chance to help provide services for their town, as well as a way to feel that they belong to a greater effort. ICRD’s program gives them an alternative. 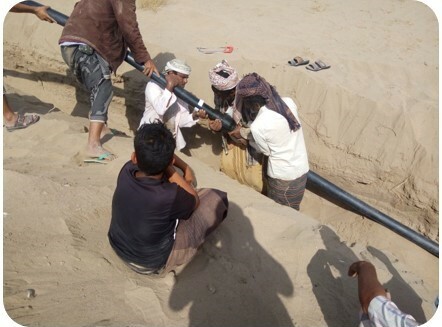 “I used to think we needed al Qaeda to help us,” said one participant, “now I feel like we can help each other, we don’t need them.” ICRD is working to prevent extremism where the Yemeni government is absent. Now, with our own government having recently gone through a shut down, programs like this are at risk. Not only multiple programs in Yemen, but ICRD’s work in Kenya training local peacebuilders, in Saudi Arabia to remove intolerance from text books – the very books that are being used by ISIS – and our work in Pakistan engaging multiple religious sects to create a counter-message to sectarian violence are also in danger. As January’s attack in Nairobi made clear, the Republic of Kenya is still vulnerable to attacks by violent extremist organizations such as al-Shabaab. As transnational terrorism remains a threat around the world, preventing future attacks in the Kenyan context calls for locally driven interventions that draw on global best practices in halting the spread of violent extremism. To this end, ICRD conducted a workshop for organizations working to halt the spread of extremist violence on the best practices in preventing violent extremism (PVE). 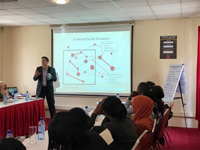 ICRD staff traveled to Nairobi to conduct a two-day PVE workshop to address drivers of violent extremism among vulnerable populations in Kenya. The workshop positively strengthened peacebuilders in the region. Trainees are now poised to implement community-level interventions intended to strengthen the resilience of local populations against the lures of violent extremism. Similarly, ICRD has spent the last several years supporting Pakistani religious leaders who have committed their lives to ending sectarian violence. Beginning in 2015, ICRD began working alongside a network of Deobandi, Ahl-e-Hadith (Salafi), Barelvi, and Shi’a religious leaders to support their mission of countering sectarian attitudes in Pakistan. This network has written a narrative promoting religious tolerance, intersect harmony, and peace, and has spent the last few years sharing that message throughout the country. Network members have put on community dialogues, lectures, conferences, radio broadcasts, television programs, exchange visits, Friday sermons, and print media publications designed to spread their message. In total, the network has conducted 183 outreach activities that have directly engaged 19,520 people. Indirect numbers of engagement have reached the millions, when taking into account the sharing of the narrative on television and radio broadcast. This fall, the network met for a final evaluation meeting which was held in concert with high-level Pakistani government officials. ICRD continues to lead the way for interfaith peacebuilding efforts around the world. This year, we are celebrating our 20th year of operation and the remarkable achievements of the Center. To date, ICRD has worked in 15 different countries and has supported peacebuilding programming across 5 continents. In celebration, ICRD is hosting our 20th Anniversary Faith-in-Action Award Dinner on Thursday, May 16 at the Army Navy Country Club in Arlington, Virginia. Please consider joining us as we reflect on ICRD’s twenty-year history and the fine work of the Center. ICRD will also be honoring the outgoing and long-serving Secretary General of Religions for Peace International, Dr. William Vendley, with our annual Faith-in-Action Award. Tickets to the event can be purchased using the link below and I do hope that you will join us for this wonderful celebration!